1. 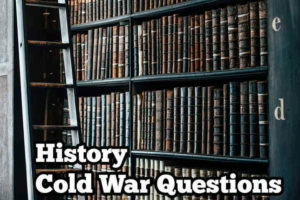 What does the term ‘Cold War’ describe? Answer: The intense rivalry that developed after World War II between groups of Communist and non-Communist nations. 2. When did Cold War developed? Answer: After the Second World War. 3. Between which nations the Cold War developed? Answer: Communist and non-Communist nations. 4. Which side is often referred to as the ‘Eastern bloc’ in Cold War? Answer: USSR and its Communist Allies. 5. Which side is often referred to as the ‘Western bloc’ in Cold War? Answer: United States and its democratic allies. 6. Why did the struggle between groups of Communists and non-Communists nations was called the ‘Cold War? Answer: Because it did not actually lead to fighting. 7. What are the characteristics of Cold War? Answer: Mutual distrust, suspicion and misunderstanding by both the United States and the Soviet Union, and their allies. 8. Which are the conditions that increased the likelihood of a third World War? Answer: Mutual distrust, suspicion and misunderstanding. 9. Who accused the Soviet Union of seeking to expand Communism throughout the world? 10. Who charged the United States with practicing imperialism and with attempting to stop revolutionary activity in other countries? 11. What was the demand of United Nations? Answer: United States wanted a world of independent nations based on democratic principles. 12. Who attempted to tightly control the areas it considered vital to its national interest, including much of Eastern Europe? 13. When did the relations between the United States and the Soviet Union had been strained? 14. When did, a revolution in Russia establish a Communist dictatorship there? 15. What was the economic system of the United States in 1920’s and 1930’s? 16. Who didn’t grant diplomatic recognition to the Soviet Union until 1933? 17. When did Germany attack the Soviet Union? 18. With whom, Soviet Union joined to fight against Germany in 1941? 19. Why it seemed possible that a lasting for friendship might develop between the United States and the Soviet Union based on their war time co-operation? Answer: The joining of Soviet Union and Western Allies in 1941. 21. What was the policy adopted by the United States towards the Soviet Union after the war ended? 22. Who led the Western bloc? 23. Name the countries who included the Western bloc? Answer: Britain, Canada, France, West Germany, Japan and Philippines. 24. Who led the Eastern bloc? 25. Name the countries who included the Eastern bloc? Answer: Albania, Bulgaria, Czechoslovakia, East Germany, Hungary, Poland and Romania. 26. When, did China join the Eastern bloc? 27. Which were the countries belonged to the non-aligned or neutral nations? Answer: India, Indonesia, Cambodia and most of the African States. 28. When did the Cold War become increasingly tense? Answer: During the late 1940’s and 1950’s. 29. What was the demand of Each Side (Western bloc and Eastern bloc)? Answer: Wanting to rule the World. 30. What was the belief of Each Side (Eastern and Western bloc)? Answer: Its political and economic systems were better than the others.